Welcome to Chicago Marine Canvas, your boat canvas top and cover specialists servicing the Chicago area. We offer a full range of services from simple repairs on marine canvas and zippers to complete fabrication of all types of boat tops and boat covers such as Aft Covers, Bimini Tops, Dodgers, Cockpit Covers, Convertible Tops, Enclosure Panels, Fly Bridge Bimini Tops, Fly Bridge Covers, Mooring Covers, Sail Covers, Windshield Covers and more. Our goal is to provide quality canvas solutions by utilizing state of the art technology on time and within our customer’s budget. Your boat’s canvas is an investment that not only makes it look beautiful but also protects it from the elements. By neglecting your boat canvas top or cover, issues can compound and multiply causing more problems well beyond the canvas itself. At Chicago Marine Canvas, we’ll listen to you and make the best recommendation suited to your needs. No boat is the same and owners use their boats in different ways. 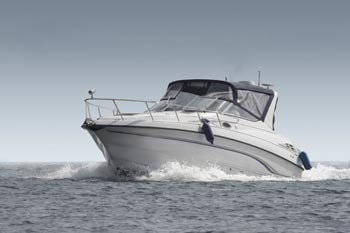 One owner of a Sea Ray Sundancer might require a heavy duty material such as Stamoid for a full enclosure to protect his family on overnight trips while another might only visit the harbor on sunny days only requiring a mooring cover. This hands on consultative approach is delivered no matter how small or large your boat top or boat cover project may be. Please explore our wide range of service for all types of boat canvas tops, boat covers and canvas repairs. Chicago Marine Canvas will design your boat canvas top, enclosure or cover using state of the art technology. 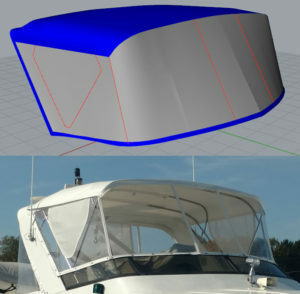 We’ll measure your boat using our 3D portable measurement solution to obtain readings within 0.05″ and then design your boat cover or top within a CAD (Computer-Aided Design) system. This allows us to send drafts to our customers for approval and allows for easy adjustments pre-fabrication. Want a window bigger? Or smaller? We can make all of these adjustments and the end results is a canvas you love that fits perfect the first time! We have used this process for full enclosures, cockpit covers, framing upholstery (new and reupholster), eisenglass window replacement, carpeting and much more. Please view at some recent projects we’ve worked on to see the results. Oh, and since we don’t need to use your old canvas as a template you can continue to use it until your new and beautiful canvas cover or top arrives! We know we’re in the mid-west, summer’s too short and you don’t have weeks to wait for a new boat top or boat cover. When utilizing our 3D portable measuring solution with CAD, the time from concept to finished product is faster than ever before. When discussing your project we’ll give you honest and accurate estimate of the time needed to give you a quality marine canvas solution. For those who are not on a tight time line and can wait for the work to be done over the off-season, let us measure your boat today and take advantage of our reduced winter rates for Spring delivery! Speed and accuracy in marine canvas tops and covers is what we deliver. “Surprise! Your invoice is 50% more than I expected!” Have you heard this before? It’s all too common in boating to receive an unwelcome surprise on an invoice. We’ll give you an estimate upon our first visit but upon signing off on your project, your price is locked in and guaranteed! The only surprise will be when you see your gorgeous new canvas top or cover on your boat! At Chicago Marine Canvas we want to earn your business. Please contact us now to discuss your marine canvas needs.